As the holiday season rolls around, many Neopians are beginning to wonder what exactly to surprise that list of Neofriends with. 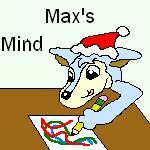 The Mind of Max ~ Christmas Special!!! The stress is about to end. I've put together the guide to a perfect, simple Christmas, away from crazy shoppers, who have incidentally become crazier as it's getting closer to Christmas. This year will be different.